Practical low cost knobs. Often used in outdoor equipment. Chrome, Satin or coloured discs available. Marker dot on skirt is standard. Pointer knobs with a matt textured finish. Marker line version is available. Standard skirts are: Plain, 0-5-0 or 0-10. Marker line on top is optional. Marker dot on skirt is standard. Available for push fitting only. 8 colours of cap are available. Caps push into the top of the knob, and can locate in any position. Skirt or cap or both may have a maker line. Available for push fit only. Two colour moulded. Body and line / cap can be 8 contrasting colours. Available for push fitting only, Two colour moulded. We have 8 standard colours. These knobs are similar to K87MA and MAR but without a coloured top. Used where colour coding is required to be more subtle. (marker line). Has separate push in caps. (8 colours). Knob and cap can be plain or with a line. Has separate push in caps. (8 colours). Knob and cap can be plain or with a line. Skirts used on K6 can be used on K12. 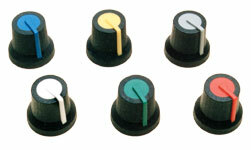 This range of knobs incorporate metal threads or threaded studs. The smallest versions with M4 studs have moulded in brass studs. Larger versions are made using ISO M4, M5, M6 or M8 steel nuts and bolts as the threaded element. K13A/M4 - M4 Thread, Black knob with brass stud. 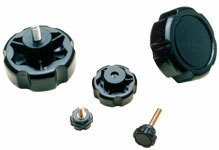 A low cost nylon knob, produced in all black version , or coloured cap version. Caps supplied pre-fitted, cannot be removed. Marker line has 4 possible locations. Available in push fix only.